Valentines is drawing close, and we have a little something special coming your way real soon so keep a lookout on Sevenpie’s website! But today, we aren’t just going to give you a promotional teaser, we are here to help the fellas out and give all the gentlemen out there some phenomenal Valentine gifts ideas that will put a huge smile on your laddies. A bouquet of flowers and chocolates were good way back then but it’s 2019 and men have to step up their game! So here are 10 Valentine’s Day gift ideas for her (you can thank us later). Saying “I Love You” is nice and all but what if you can remind her of your love with when when you can’t be there for her 24/7? The best part? A bracelet that’s made to order based on your own handwriting! Etsy let’s you do just that, and they provide them in 18K gold, rose gold, or sterling silver. If binge watching movies is a usual weekend date, then getting this scratch off movie poster would save tons of time asking questions like “what do you wanna watch?” which usually takes a really long time to answer. Are you a couple who already knows pretty much everything about each other? Do you often sit in silence because there is nothing much to talk about? Well this is a perfect gift! We’re bending the rules here ( GIF reference not intended) a little because this gift is potentially for the both of you. 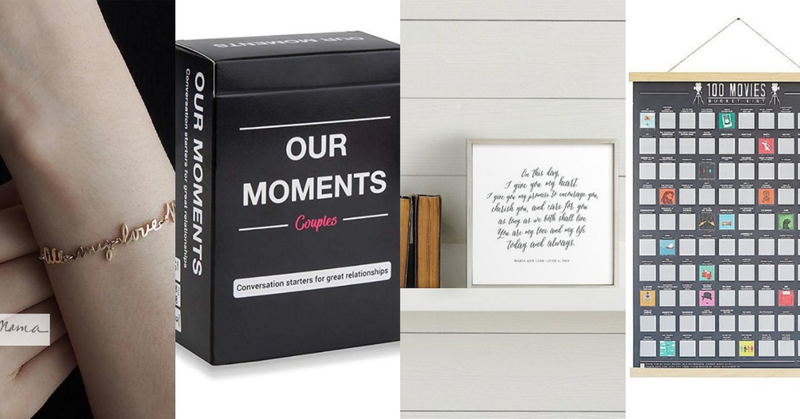 Get this cute game of conversation starters at Amazon.com to avoid awkward silences during road trips and dinner dates. Jewellery is a girl’s bestfriend. Get her name (or maybe yours) spelled onto a pair of earrings! Let the other guys know that you owned her (evil grin)! Click here to purchase one specially for her! Who said married couples are boring? Well, here’s one for the married ones out there! Pick the best lines from your vows and remind her of the words you told her at the alter! Minted.com prints your vows so you can display it now and forever. Does she love her wine? Get her a jumbo size wine glass from Amazon.com so she can enjoy her wine after a long day without the hassle of constantly refilling her wine glass. Does she love to cook? Sign her up for a Masterclass where she finally gets to learn techniques and skills to sharpen her cooking! And who knows? You could be the reason she ends up on Masterchef! Sign her up At 19 Culinary Studio! Each day for the next three years, this little book from Wallmart.com provides amazing questions about your relationship for the both of you to answer while she journals it down. And yes, we mean the both of you have to answer it, So that means you fellas aren’t off the hook! Trust us, girls love this kind of thing. A cookbook that would eventually be turned into a gift for you! Of course we saved the best for last! Too broke to afford any of these gifts? Fret not! Check out our Valentine on a budget article.